A southwest breeze bathed the Land of Ooze with refreshing warmth. 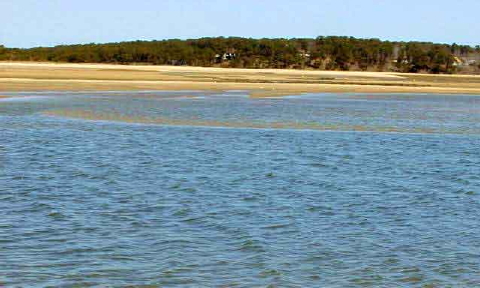 Blue skies and lazy clouds painted Wellfleet Bay in springtime hues. 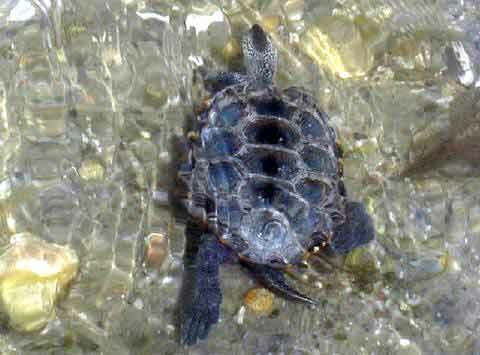 Still, few turtles have emerged from brumation. But with a string of 70°F days in the immediate forecast, it’s only a matter of time. One hazard surprised me as I waded the creek. So many pairs of mating horseshoe crabs have gathered in the low tide rip that it has converted the rapids into a virtual minefield. 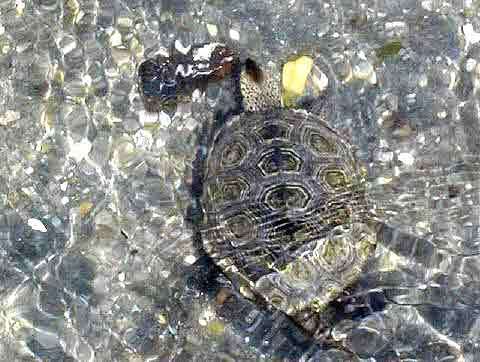 Two male terrapins floated through the rip this morning. Number 1052 came first; an 8-year-old with perfectly pristine carapace and plastron, he tipped the scales at 222 grams and stretched to 11 centimeters long. A few minutes later a repeat customer swam into view. 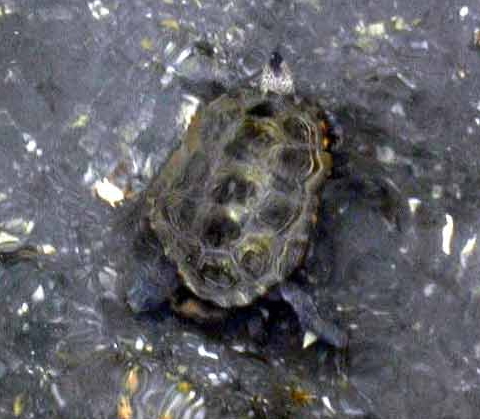 Terrapin 1047, you may recall, was first observed a week ago on 23 April in the first group of turtles seen active in 2001 (see Firsts — 23 April 2001). In the last week, he seems to have warmed up a lot and has become quite active and aggressive. 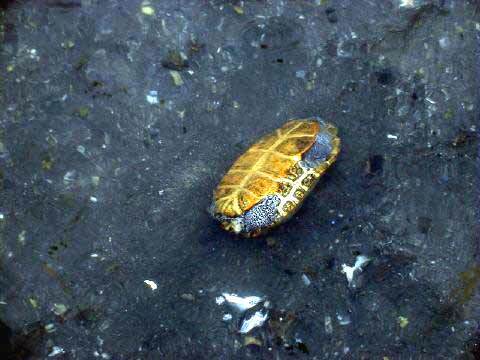 He lost 4 grams in weight with his shell peeling off its winter covering. 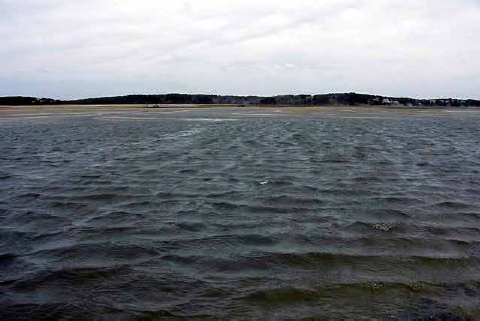 Still blowing from the north, winds subsided to less than 10 knots and air temperature lingered in the mid 40s, but water over the tidal flats had climbed back to 51°F by 9:30 this morning. 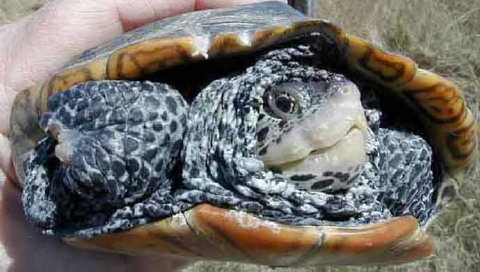 In short, conditions moderated just enough to allow a couple of terrapins to re-emerge from frozen slumber with the renewed promise of springtime. Horseshoe crabs resumed mating in numbers along the edge of low-tide sandbars in the middle of Blackfish Creek. And while sometimes I whine a bit about murky conditions in the turbulent rapids over the rip, I must admit that this morning even I couldn’t find much to complain about. Water visibility was near perfect and you could see anything that moved through and along Blackfish Creek. A mature male terrapin, #710, plopped over the rapids and bobbed along the shallows, snorkeling for air as he paddled toward the safety of deeper water. Last seen on the evening of 3 June 2000 coming through the same rip, this turtle looked like he enjoyed a good 2000 summer season and survived the winter quite well, too. Already one of the largest males we have observed in Wellfleet Harbor at 13.1 centimeters carapace length, #710 managed to gain another 5% mass to reach 340 grams body weight. A 10-year-old female (#1051) spun through the rapids at almost the same time. She was nearly 17 centimeters long and weighed in at 844 grams. On closer examination, I noticed she had lost all the toes on her right front limb, and several of the toes and claws on her right rear leg were also gone. Neither injury slowed her down. 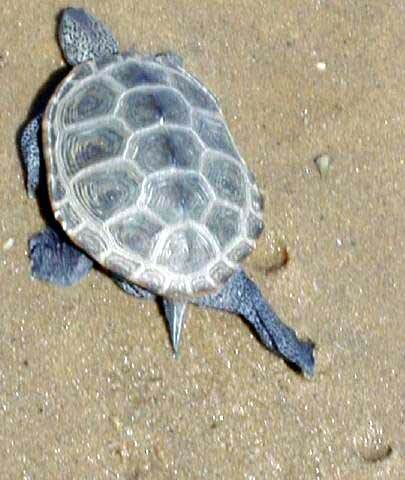 She hissed a warning as I snatched her from the rip and on release she sped toward the creek, leaving a peg hole where her right limb touched the sand. Both turtles seemed stone cold to the touch when I first recovered them from the rip. As I measured, weighed, documented, and marked them, they warmed up considerably. And by the time they were released, they had become fully alert and active. They raced from the beach to the water line and paddled off into the creek at full speed. Overnight saw temperatures dip to freezing (32°F). So, I was unsurprised at daybreak readings of 47°F air and 50°F water. Nor was I surprised that not a single terrapin remained active in Blackfish Creek. 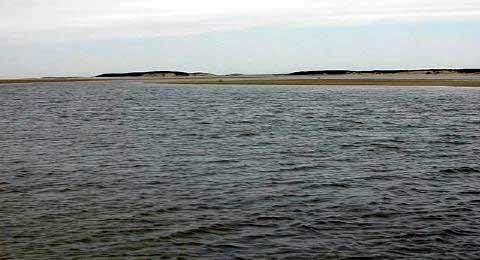 In fact, horseshoe crab mating along the sandbars of the rip has dropped to near nothing. Only a single pair appeared during the entire span of the morning low tide. Winds were still gusting out of the north at 25 knots, but by mid-morning the clouds had begun to part, the breeze had moderated to 10 to 15, and sunshine broke through. Forecasts for Monday through Friday predict highs of 70 degrees and lows dropping only to around 50. The turtles will awake once more. 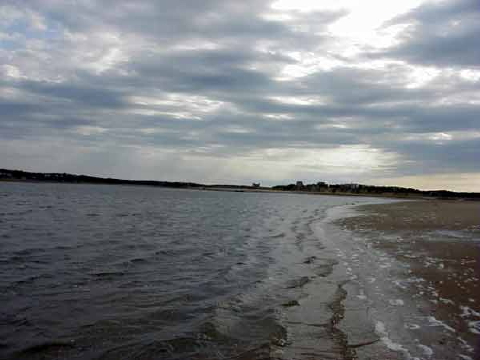 Air temperature 44°F, water 49°F, wind 20 knots out of the NE with 30+ gusts = a return to brumation. 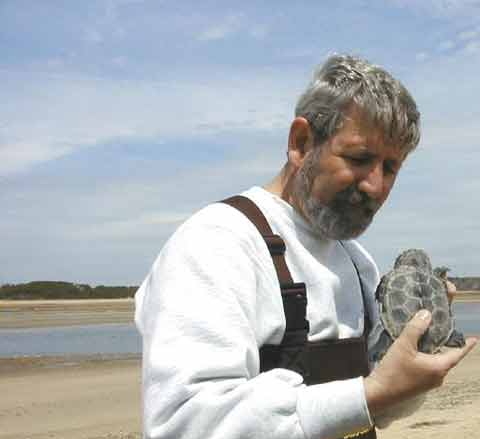 Showing an even-keeled sensibility, which has enabled 250 million years of survival, the Wellfleet Bay terrapins’ decision to retreat was indeed the better part of valor. Not a single turtle braved today’s brutal conditions, opting instead to rest snuggly in the oozy warmth of their muddy beds. “Wake me when this miserable spring is over,” one yawned to the other. And near-audible z’s could be felt resonating from the bottom of Blackfish Creek. If only humans had such a fine-honed sense of perspective. Winter returned to the Land of Ooze. No snow nor sleet nor freezing rain — just plain cold. The thermometer registered 41 degrees as I climbed the barrier dune to reach Blackfish Creek and face a stiff 15-knot wind blowing off the North Atlantic out of the northeast. I’ll let you do the wind chill calculations. Not only was the air cold, but two days of blustery conditions plunged creek water temperature back to 48 degrees — well below our terrapins 55°F wake-up call. So, the sleeping beauties remain sleeping, but the poor critters that have already popped out of brumation are enduring some challenging moments. Nothing seems to stop the horseshoe crabs, though. Pairs locked in mating bliss flowed through the channel and cozied up to emerging sandbars to lay eggs. I didn’t expect and hoped not to find many turtles out and about this morning. So, I was not surprised that no heads popped up for most of the tidal flow. But nearing ebb, I saw one female struggling through the rip. So cold and sluggish was she, that as she tried to propel herself through the rapids, she flipped completely upside down. Her orange plastron spun like a lighthouse beam to guide me through murk and turbulence to net her. Terrapin 774 proved a very interesting recapture. We saw her last on the evening of 4 June 2000, as she negotiated this same channel. At the time, she was a pre-pubescent turtle of only 14.5 centimeters and 522 grams — both well below the 15.75-cm and 650-gram threshold for a nesting female. 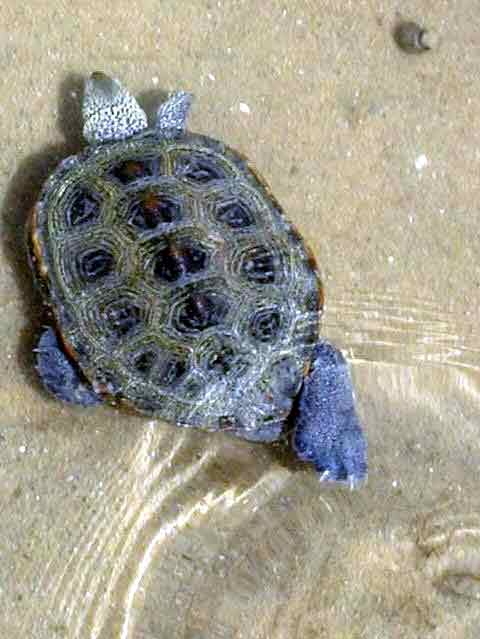 Since then, this 8-year-old terrapin has spurted nearly 10% in linear dimensions and 20% in mass, so that 2001 may mark her first year of maturity. Similar spurts were noted in three females last year as they, too, straddled the puberty line. Examining her hind quarters, #774 showed signs of having freshly emerged from brumation with muddy residue apparent along her tail. Only a moment or two later, a 6-year-old-male plopped over the rip. His dark carapace matched the color of the day and the water. The play of reflection and illusion under murky overcast yields a surreal portrait of these animals as they slip through the rippling current. 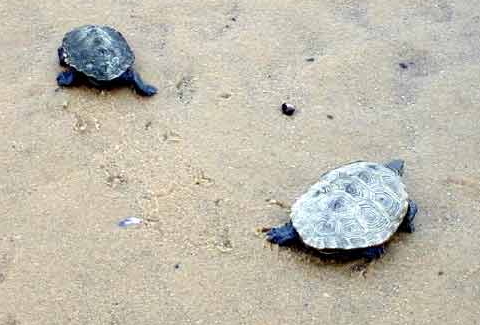 Both turtles were cold to the touch and seemed sluggishly disoriented. So, it was with some concern that I released them and watched as they carved their separate paths back to the wild of Blackfish Creek. With luck we’ll see #774 again this summer as she crawls ashore in June and again in July to deposit her first nests of soon-to-be strapping hatchlings to join our Wellfleet Bay population of diamondback terrapins. 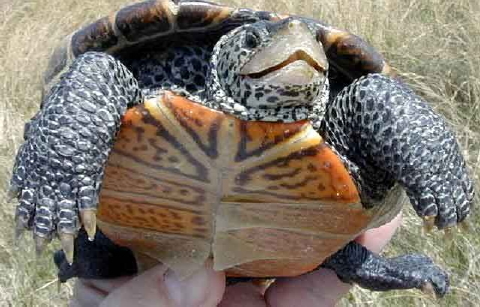 You are currently browsing the Turtle Journal blog archives for April, 2001.